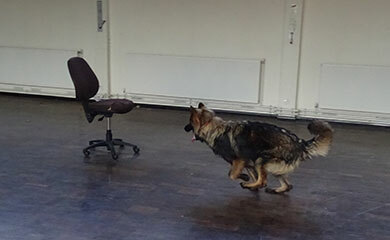 Trainee police pup Cosmic may not be the bravest but can he still make the grade? Cosmic was one of 7 pups in our C litter. Here he is when he was 6 weeks old. Growing up Cosmic has not been the bravest of our pups but his puppy walkers Lindsay and Anthony have never given up on him helping him to overcome almost everything that he has found to be a problem. 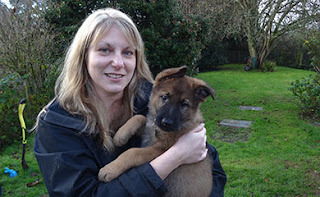 Cosmic is pictured here at 8 weeks being collected by Lindsay from our house when all the pups went to their puppy walkers. 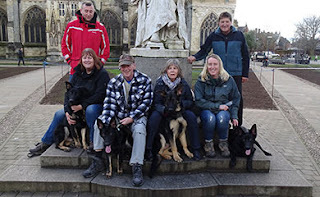 Here he is with Lindsay and Anthony pictured on the left of the group on one of our training days where we took all the pups to Exeter city centre when they were 4 months old. 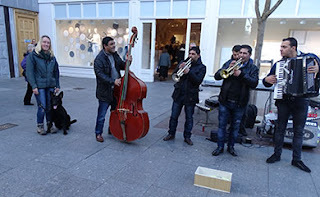 They are also pictured on their own with Cosmic. 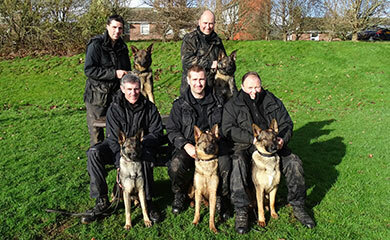 Lindsay and Cosmic are pictured 2nd from the right on another of our training days. Here is a sample of some of the things that Cosmic has had problems with during his time with Linsday and Anthony. HOOVER, HAIRDRYER, FIREWORKS, GUNFIRE, SPANIELS, SMOKE ALARM, COWS MOOING, GOING INTO VETS ROOM, BIN BAGS, SOUND OF POPCORN IN THE MICROWAVE, STEAKS SIZZLING IN THE FRYING PAN, GOING OUT IN THE DARK, VARIOUS GARDEN ORNAMENTS, PLASTIC BAG WAVED OVERHEAD. The list is by no means exhaustive and Lindsay will say the things that bother him are often quite random. 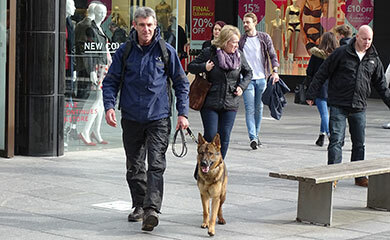 I can hear a lot of dog handlers out there asking the question ‘why is he still in the program’? Well there are a number of reasons. 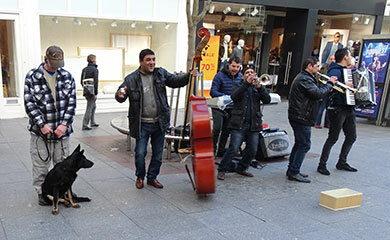 He is a very willing and biddable dog with a very strong work ethic. 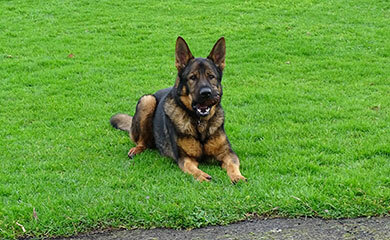 He is very intelligent and athletic dog with a really friendly and social disposition. 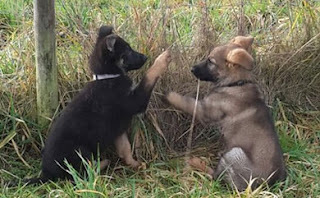 With encouragement he is able to get over things and surprisingly on the courage tests he assessed very well. 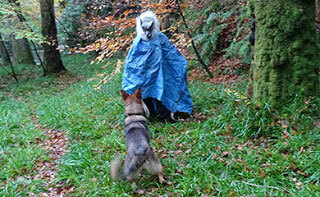 He is pictured dealing very well with a strange figure jumping out from behind a tree whilst on a walk. 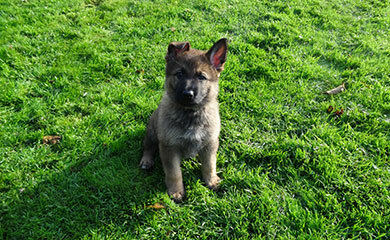 Cosmic’s mother Ruby had a pup called Argo in her 1st litter ( the A litter) who was also very unsure with lots of things. 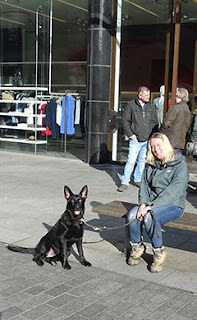 We persevered with Argo who also was puppy walked by a very supportive puppy walker Lyn Parlour. 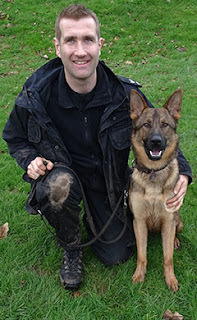 Because of his good qualities and as an experiment I handled him through a 13 week initial Police dog course which was the making of him. It built his confidence; he passed the course with flying colours and was then allocated to his current handler Mandy a Police dog handler in Avon and Somerset. 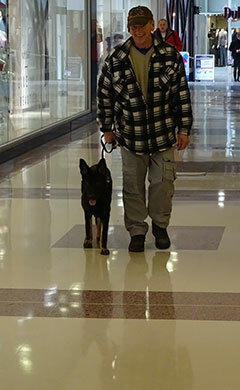 Mandy tells me that Argo is doing extremely well. 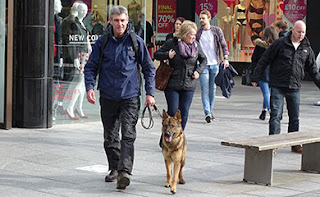 I believe that with maturity Cosmic will also make an excellent Police dog. I base this on the way he manages to get over things and the excellent progress we are making with his issue with the sound of gunfire. 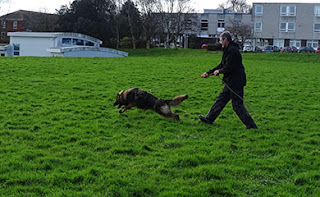 When we started the course 3 weeks ago we didn’t have a handler for Cosmic and so I have been working him. I have found him to be very responsive and determined in all of his work. Here he is showing real determination in his Tracking work. His criminal work is very determined and tenacious. His person searching is also excellent. I took him into Exeter city centre and found him to be very confident and reliable with all the various crowds, children and dogs. I never had any issues or worries with how he would react with all the hustle and bustle. He was a pleasure to take out. When assessing young dogs I can get a very accurate picture of their character from how they deal with all the different things going on and how they cope with stimuli coming from all directions in a busy city environment. 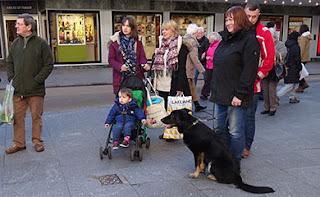 I would recommend regular trips into busy towns and city centres for any dog because it definitely improves the dog’s nerves and coping system. Here is Police pup Roxy on our training day today not at all fazed by a very noisy band in the high street. 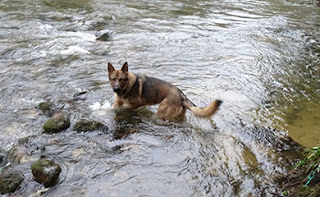 I also took him down to a river and found him very confident in the water. 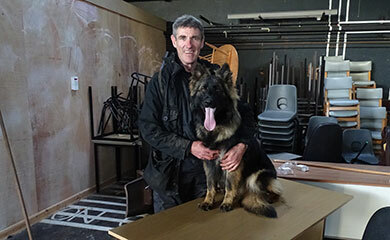 After working and looking after him for the first 3 weeks of this course I have concluded that once he gets his own full time handler and develops a bond he has the potential to be an outstanding Police dog and just as important be a pleasure to live with. 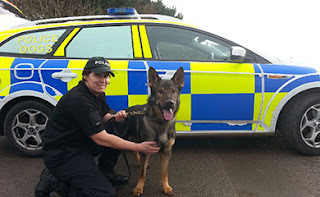 As luck would have it we now have a handler for Cosmic. Sgt James Little has just been appointed as the new dog Sgt for Cornwall and allocated a place on our Initial Police dog course. Cosmic will be his first dog. They are pictured here after being paired together this week and already they are getting on like a house on fire. With the addition of James here are all the members of the revised Initial Police dog course. 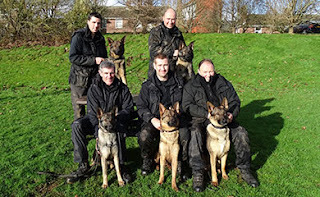 All 5 dogs have just completed 4 weeks of their 13 weeks of training. 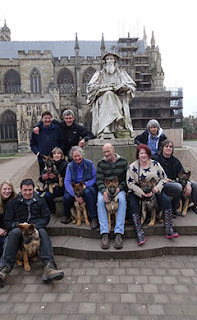 Rear left Andy and Comet, Rear right Tim and Cagney, front left me and Charley, centre James and Cosmic and front right Mark and Chaos. Charley is now our spare dog and she will continue her training on the course and be handled by me. 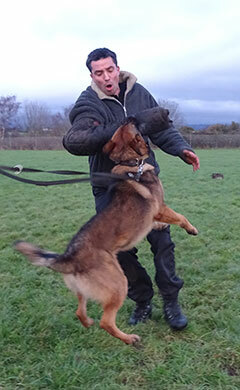 Should Cosmic or any of the other dogs not make the grade then Charley will then step in. 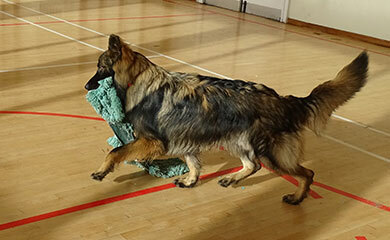 If all the dogs qualify then Charley will probably go to another force at the end of the course. Getting back to Cosmic the biggest problem we have had to overcome is his fear of gunfire. On hearing the sound of the 38 revolver he would try to run away from the area. 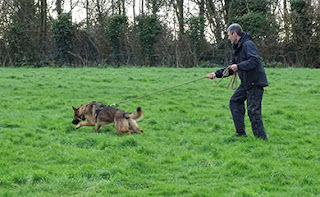 To get him to be more confident with the gun I started by letting him see the other dogs doing their criminal work on the field from within the security of his dog van. Because he loves doing his criminal work ie biting the criminal he soon became jealous of the other dogs having fun and wanted to come out and join in. Each day the gun was fired nearer and nearer and after a week he was quite happy to come outside the van when the gun was fired. 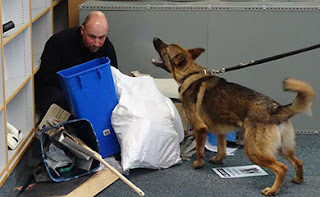 We then moved him closer and at the end of the week he was only 30 metres away and was so excited about biting the criminal he didn’t bother about the gun at all. Over the coming weeks we will bring it closer still. I have included a short clip of Cosmic now doing his criminal work after the gun has been fired and as you can see he is not worried any more. 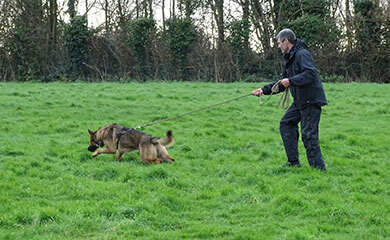 So there you have it Cosmic is on the up and you will see how he and his fellow C litter siblings and handlers get on during the course. 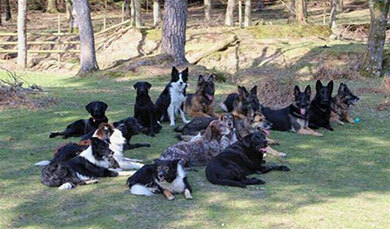 I will do a blog feature on how all of all the dog teams are doing in 2 weeks. 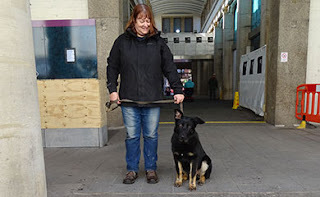 Everyone who follows the blog will know that Brodie from our B litter was born with very bad hips and had both hips replaced last year. He has been looked after by Sgt Colin Harper and his wife Leah for the last 6 months while a suitable home could be found. 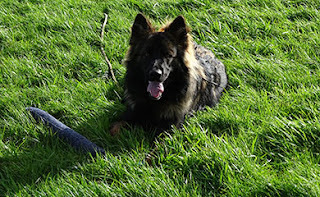 Unfortunately he has come back to us from 2 homes because as lovely a character as he is he is a very lively high energy dog which the new owners could not cope with. 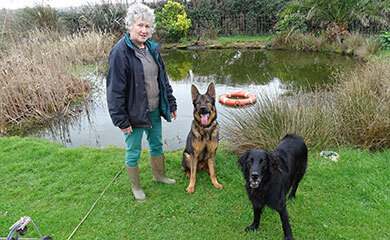 Fortunately he has been offered a new home with Jo and Roger along with their flat coated retrievers Wisteria aged 11, Ash aged 4 and German Shepherd Bonny aged 13 who unfortunately has CDRM which is a spine condition. 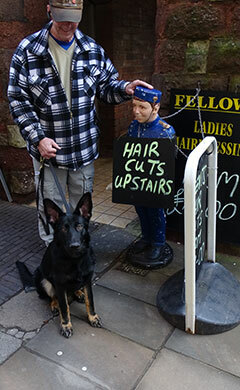 Jo is a retired vet and her husband Terry is a retired builder. Brodie seems to be happy with his new pals and all of Jo’s dogs live in the house together. Fingers crossed that Brodie behaves himself and we hope this will be his forever home. 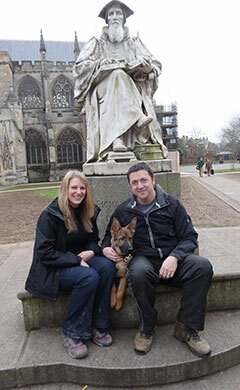 Jacque was donated to our Police force by widow Diane Oldfield from Truro whose husband Peter died when Jacque was only 5 months old. 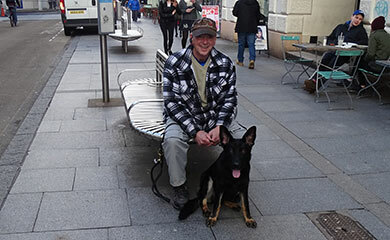 Peter was a former Devon and Cornwall Police officer and was a good friend of legendary Police dog handler Jack Rule. loud and unusual noises and tracking potential. He passed with flying colours and I am confident he can make a very good Police dog. His puppy walker Heather who lives alone with 2 small children is doing a great job with Jacque. Jacque was quite happy and confident being on raised surfaces and platforms. 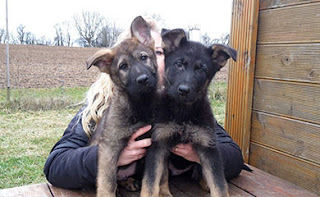 Our pups have been with us for over 2 months since they came to us from Germany aged 4 months and they have settled in well. They were all very confident in Exeter city centre and nothing seemed to faze them. Here are a few more pictures of the visit. 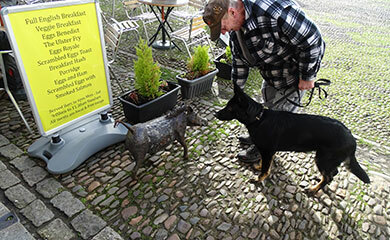 Roz meets the metal boar. Roz on the shiny floors. Rocky waiting for his ears to come up. 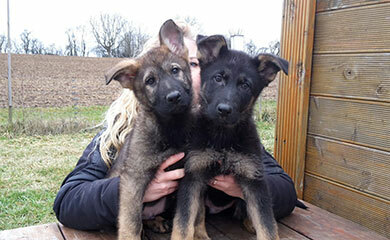 Finally here are 2 of the pups we are hoping to bring back from Germany called Bedwyr and Bevan in late March now aged 9 weeks. If you thought you were a good dog trainer than how about this from an old acquaintance of mine 72 year old dog trainer Rosemary doing a long down with the dogs in her working trials club in Dorset.